Christians should be very good at resolving conflicts because ours is a religion of reconciled relationships. Christianity is a religion of peace, with God and with each other. “Blessed are the peacemakers” is what Jesus said. However, conflicts can be challenging to resolve when there is a power differential between the parties, such as in the work environment between a team member and a team leader. So here are some suggestions to team members who may feel there is nothing they can do. “I might get fired if I say anything” is what probably keeps many ministry employees from doing their Christian duty to make peace. But that thought assumes the leader is malicious, vengeful, and unwilling to make things right; it assumes the Christian leader is unChristian in behaviour. It also assumes there are no systems to protect employees and that the leader has ultimate power, neither of which is usually true (and should never be true). Not dealing with conflict also means you are missing an opportunity to develop your own Christian character. People may react badly upon hearing they are involved in a conflict, but the presumption should be that given a bit of time to reflect, Christians will examine themselves and do all they can to resolve the conflict. 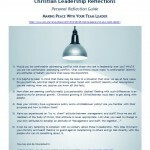 Leaders are fallible, just as their team members are, but they do want to be good Christian leaders. It should be safe to talk with the leader because they should be committed to leading the ministry in a godly way and should welcome someone giving them a chance to either correct a misunderstanding or to apologize and correct the problem. That’s a lot of shoulds, so what protects the team member if one of the shoulds isn’t true? Leaders are subject to other, more senior, leaders and the senior leader is subject to the board (which should be a group of independent people strong enough to discipline or fire the senior leader when circumstances warrant). The fact that the leader is accountable to another person or group is a check on their behaviour. A grievance policy protects against unfairness to an individual and a whistleblower policy protects against unethical behaviour that harms the organization. Employees are also protected by board policies that guide the senior leader’s behaviour and by the board’s verification plan to ensure its policies are being followed. This ensures you have a way to elevate your concerns to someone who can do something about them. But a caution is in order, people normally assume that what they know, or think they know, is objective reality when often they have only seen a piece of it. What looks unreasonable to you may turn out to be very reasonable. The safest assumption is to assume you don’t know everything and therefore the basic approach to resolving conflict is to ask questions, rather than make assertions. Before elevating your concern, ask questions. Questions lead to dialogue and resolution. grow in your own emotional and relational maturity. Occasionally a leader creates conflict by treating staff unfairly or by not acting in the best interests of the ministry. This is when you use the grievance or whistleblower policy. It is now the board’s issue, not yours, and they can do an objective assessment of the situation. A team member may not agree with the strategic or operational decisions made by the leader. The fact is that not all decisions have unanimous support. But it is a rare decision that is made by one person absolutely on their own. Most often a leader makes decisions either in consultation with others or with a consensus from others. (See The Leader’s Veto Power for more on this.) Most often team members can accept that a decision went another way and while there may be disappointment, there isn’t a problem. But sometimes the issue may be so serious that a team member cannot let it go. If a team member truly believes the consequences could be disastrous (meaning the continued existence of the ministry is at stake), and the leader refuses to reconsider, then follow the whistleblower policy and inform the board. Even though this is not a matter of ethics (which the whistleblower policy is all about), the whistleblower policy does provide an appropriate channel through which staff members can contact the board for a review of the situation. The important point is that the team member followed policy and did not act in a rebellious way. Do not complain or grumble to other staff members about your issues with leadership. Follow the guidance in James 5:9, “Don’t grumble against one another, brothers and sisters, or you will be judged.” Complaining or grumbling to other staff members is not helpful. They can’t help you, it sows seeds of dissent and that impairs the leader’s ability to lead because it poisons the environment. It also means you are not testing the accuracy of your perceptions. Going through proper channels or speaking directly with the leader opens up your complaint to testing and then the issue can be resolved one way or the other. But when a leader discovers you are grumbling to others, the trust relationship the leader has with you will be severely challenged, if not completely broken! When talking with a leader, remember that private meetings are the only appropriate setting for blunt discussions. Otherwise, in a public venue such as a staff meeting, matters of disagreement should be discussed in an exploring way rather than a confrontational way. For example, saying “I am concerned about the effect this would have on …. Has management considered how to deal with this potential problem?” is a respectful way to raise your concern. On the other hand, saying “I disagree and don’t think we should do this” does not lead to helpful discussion but to open conflict. If you simply cannot resolve the conflict to your satisfaction and it continues to be an issue for you, then for your health, happiness and career you should remove yourself from the conflict. Life is too short to stay in a place where, because of your attitude towards someone, you are robbing yourself of the joy that Christ died to give you. Find a place better suited to who you are. There is a system in place (or should be) for a leader’s performance to be reviewed and for them to be held to account for their leadership. Everything you think that needs to be dealt with will be dealt with — if it really is a legitimate issue. It’s to your advantage to contribute to an environment that allows the leader to find joy at work because how a leader feels has an effect on the office environment, and I’m sure you’d like to have a pleasant place to work. Make a positive contribution to the leader’s work so that it is a joy.